Known as the father of the modern poster, Jules Chret (1836 1932) was a French painter and lithographer. He worked on everything from theater to advertising. 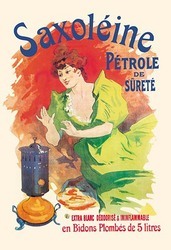 One in Cheret's iconic series for the Saxoleine lamp oil company, here featuring a woman warming her hands on a kerosene heater.